Red-barked dogwood ‘Sibirica’, cornus alba 'Sibirica', is an attractive shrub with high ornamental value in winter gardens. Red-barked dogwood ‘Sibirica’ is mostly grown for its scarlet young shoots that can brighten winter borders or make a great addition to mixed hedges. 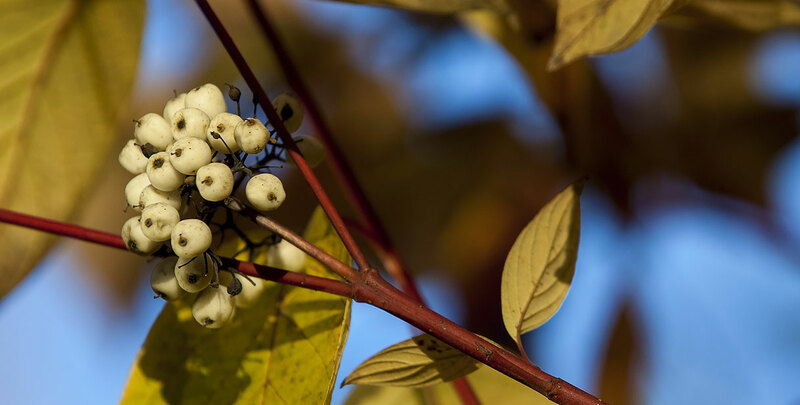 This dogwood cultivar bears dark green leaves until autumn arrives, but after the leaves have turned reddish-purple and fall, the lovely bright-red stems will appear to brighten up and add colour to the winter garden. Flowers appear in May-June, succeeded by blue-tinged, creamy-white berries. Red-barked dogwood ‘Sibirica’ is even more attractive when planted in groups mixed with related hybrids and species, available in a wide range colours. Mixed plantings can make a stunning display without requiring much effort. Red-barked dogwood hedges must be pruned annually to ensure new, yellow growth and to keep it in check. Cut back one-third or up to half of the twigs to just above ground level, preferably selecting older stems. Red-barked dogwood ‘Sibirica’ is fast growing, with an average growth rate of 20-40cm p.a. It will do best in full sun or partial shade in a moderately fertile, wet soil – for example along the waterside – but it is tolerant of a wide range of soil types and positions. The stems will be at their brightest if the shrub is allowed to grow in full sun.